This 1,000 count bulk pack includes five, 200-round Battle Packs from Prvi Partizan. 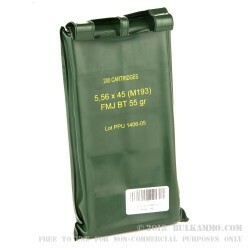 Battle Packs are tightly sealed polyurethane containers which protect the 5.56x45mm from moisture and humidity while in storage or during field transportation. Each bag has a double-handle for easy carry and a flat profile for simple stacking. 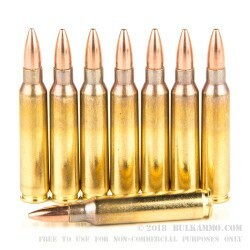 Prvi Partizan is a Serbian manufacturer and produces these rounds to M193 specifications in accordance with NATO small arms munitions doctrine. 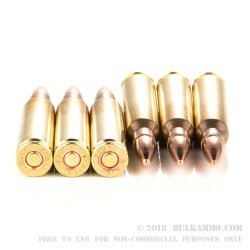 As such, these cartridges are built using annealed brass casings which can hold up to multiple reloads without splitting at the neck and shoulder. Each case is equipped with a non-corrosive Boxer primer and crowned by a 55 grain full metal jacket projectile with a boat tail (FMJ-BT) rear. 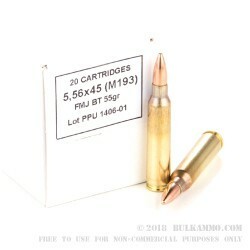 The FMJ-BT profile is sculpted for drag resistance while the standard bullet weight will stabilize cleanly from virtually any 5.56NATO barrel length and twist rate on the market.